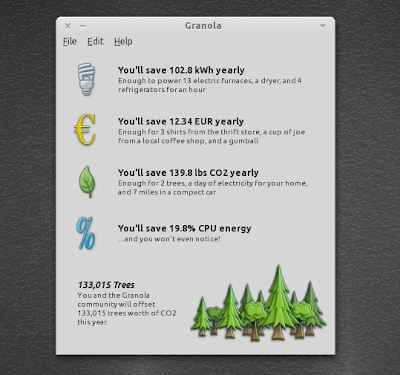 Granola is an application to improve your netbook / laptop battery life but can be used on your PC too and "make your PC environmentally friendly". 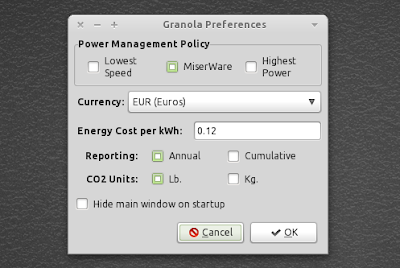 Granola runs in the background but if you install the GUI, you'll be able to see some statistics such as how much energy, money and CO2 you'll be saving by running Granola on your computer as well as the overall savings by all Granola users. The energy saving depends on your computer activity: if you mostly surf the Internet, the Granola wiki states that you will probably save around 30% energy. If you are playing games without a pretty new graphics card, the savings are less: around 10%. If you're interested in benchmarks, you can take a look @ Granola website. Please note that I didn't benchmark Granola myself so I cannot guarantee it actually works. Granola uses a technology called "dynamic voltage and frequency scaling" or DVFS which is available on most computers (manufactured in the last 5 years). This means you must make sure DVFS is enabled in the BIOS to be able to use Granola. Instructions for enabling DVFS control in the BIOS can be found @ Granola wiki. Granola comes with 3 power management profiles. By default, the "MiserWare" profile is selected which dynamically adjusts Granola (recommended) or you can manually set Granola to "Highest Power" - settings which will always use the highest power settings. Setting Granola to "Lowest Speed" will save as much power as possible, however this may slow down your computer. After installing Granola, if you register on its website you can track your savings across multiple machines. Granola is not open-source, but is free for personal use. I've found out about Granola from Pinguy OS - so thanks to Pinguy for this!